A bar owner in Nebraska got a $200 surprise when she opened a letter from an ex-employee. 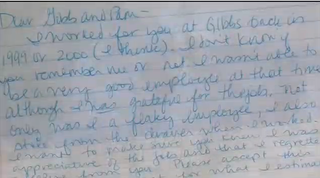 Pamela Hedges said she got a handwritten letter from a former employee who worked for her and her husband more than fifteen years ago at a bar they used to own called Gibb's. In the letter, the ex-employee apologized for stealing from the register and she included a check to Hedges for $200, to compensate her for the money she took. "I worked for you at Gibbs back in 1999 or 2000 (I think)," the letter read. ".. Not only was I flaky employee, I also stole from the drawer when I worked." "I want to make sure you know I was appreciative of the job and that I regretted stealing from you. Please accept this check for what I estimate to be how much I stole. I hope you are both well," the woman wrote. The woman, who asked to remain anonymous, told ABC News, "I returned the money because it was wrong and I regret it." "I was young and I was dishonest. I only worked at the bar for a month or two on the weekends. I wasn't a very good bartender," she said. "If I can speak with them [Pamela and Gibb Hedges] again, I would tell them how much I appreciated the job," the ex-barmaid said. "I have my life back on the right track now, and I regret everything I did." "If I can speak with them [Pamela and Gibb Hedge] again, I would tell them how much I appreciated the job," the ex-employee said. "I have my life back on the right track now, and I regret everything I did." Hedges, who owned Gibb's for 30 years with her husband, said she suspected there was theft at their bar back then, but was never really able to prove it. "My husband couldn't believe this," she said. "It was just such a rare circumstance. Especially for her to do that after 15 years." Hedges said she was curious about why the woman decided to write her after all these years. "It was so courageous for her to first, admit her mistake," she said. Hedges said now plans to write back to the woman who wrote her the letter and find out more.